Hi, my name is Jason and I did a 1 day Dopamine Fast last December 26, 2018. This article will be about my experiences, thoughts, advice, tips and how to do it correctly. I will also make sure suggestions as I think you could do it with an easier method. However, this dopamine fast really brought me into conclusion that it is a very helpful tool to better understand oneself. Before I start this article, I would like to give you some points I want to be clear. First, I am here to explain everything I realized and experienced. Thus, I will be completely honest. Second, I have no proof to you that I did the Dopamine Fast but I 100% swear that I’ve finished the challenge and experienced some results. Third, I am a fan of challenges itself, I completed the 90 days no gaming challenge months before this as I really want to change my life. If you are interested, you may check my article out: Quitting Games. I recommend that you should also read the article because I also have a lot of learnings from that challenge. Fourth, I am just one single man that has been finished and explained how Dopamine Fast works. I will try to explain everything I know but I am by no means an expert in this. However, I will promise you that I will give my 101% in explaining everything to the best of my knowledge. If you have any questions or things to add, do not hesitate to comment down below and I will gladly appreciate your tips for me. Before that, let me first explain what is Dopamine. According to Psychology Today, Dopamine is a neurotransmitter that regulate movements, attention, learning and emotional response. This not only let us see rewards, but will urge us to take action towards them. In simpler terms, it is a chemical in our brain that drives us in doing the pleasurable things in life. Dopamine is released when we expect some reward. This is also the reason we are so motivated to do things that makes us feel good. Our brain loves dopamine that much. But there is a problem with that. Because we are wired to get hooked on dopamine so much, our brain gets used to it. You see, there are dopamine receptors in our brain where dopamine attach. When dopamine attached to the receptor, that’s when the effects take place. The problem with that is our body is adapted in achieving homeostasis. Which is layman’s term is our body wants to achieve balance. Once you always get that high, your body becomes immune to it by removing some dopamine receptors. That means, if there are less receptors in your brain for Dopamine, the same amount of Dopamine would not feel as good as before. This is also the reason for addiction. Let me give you an example, do you remember having your first 50 likes on your Facebook photo? It feels really good right? However, do you think people who gets 1,000+ likes on their photo would still be happy when one of their photo only gets 50 likes? They might even be frustrated instead of happy. That is why a lot of people do their best to get good pictures and get as much like as possible. A motivation and urge to get that hit of dopamine. But the more we increase the dose of Dopamine in our brain, it would do otherwise by reducing the receptors. Thus, we need to give it more and more dopamine in order to get the feeling we are looking for. That’s why you would see a lot of people who we think are very successful and has everything in life but still depressed. And that is also why I also did a 1 week social media detox. I told you that I love doing challenges to improve myself. Hey! That’s a good read. Why not check it out! 1 week Social Media Detox, there is the link. A Dopamine Fast is where you remove all the things that gets you happy (Dopamine Producting Activiies) , so that you would return your Brain’s dopamine receptors back to when it used to be happy on little things. So what does that mean? Have you seen how kids are happy with the little things in life? Why do you think adults need more things to be happy? I hope you get my point in this. The point of a Dopamine fast is to return your brain’s dopamine receptors back to when it is before. There are numerous advantages as to why it is very helpful to your physical and mental well being. More on that later. I hope you now get what a dopamine fast is. But did I invent this thing? No. I actually found it on YouTube when someone uploaded a Video on how to achieve things in life. Here is the Video, it pretty much explains why a Dopamine fast is a great tool in bringing your life back together. I suggest you also watch it. Credits to Improvement Pill to this video. Without him, I would not know about this great tool. So that is where I learned about the Dopamine Fast. Now let us start on my experiences on the challenge itself. So the promise of a Dopamine fast is to get your life back together. It is to get the motivation to do things in life that should’ve been for your own good. The problem with that is your brain wants some instant reward. That’s why it is more fun to binge eat a chocolate lava cake than going to the gym to have a healthy body. The same goes for me. I am losing some motivation in improving upon myself. In fact, I have an online business that needs 110% of my attention. The problem with a business is that without the effort of the owner, there won’t be any progress. I truly believe that what you plant is the one you will sow, and if I do not work hard for myself, I will not sow anything in the future. i do not believe in the quick rich scheme. I do believe that every successful business stems from the entrepreneurial spirit of its founder. The problem with that is it will take time. Like my business that earns me money now, if I don’t work harder, I won’t be satisfied until I’m successful. Since it will take time, I am always procrastinating upon improving my websites. If I do not work for my business, who will then? I need to get some motivation. So I need to reset my dopamine receptors so it would get excited again. The same excitement I felt when I first opened my website and shared things to the world. The first excitement I felt when my website got into google. If I got that motivation back, I would work a lot more efficiently and harder to achieve my tasks. In fact, that is my goal for 2019. To upgrade my online business. Turns out, upon doing the dopamine fast, I reached the deep parts of my mind and learned something deeper. More on that later. But for the start, I really want to do the Dopamine fast in order to get my motivation in building my online business back. I can’t slack off anymore. I need the urge to do it. Since dopamine is one of the neurotransmitter in charge of motivation, I need to try this out and start rocking my 2019. But the problem is that, Improvement pill said that the best way to do the Dopamine fast is to do it on new year’s eve. This of course comes with a reason so you could start the new year with a bang. But there is a reason why I did it on the 26th. I did the 1 week no social media challenge as I said above in which I will hit 2 birds in 1 stone simply because not using social media is part of the Dopamine Fast. I will be at my Grandma’s place this coming New Year, so I have to talk with my relatives. One of the Rules of a Dopamine fast is that you prevent any forms of social interaction or contact throughout the day. I do think that there is no harm in starting a week earlier. I do need the motivation to move faster as soon as possible. So if you spared a few minutes to watch the video above, you would know the rules in doing a Dopamine fast. But if you did not, do not worry as I will explain it to you. 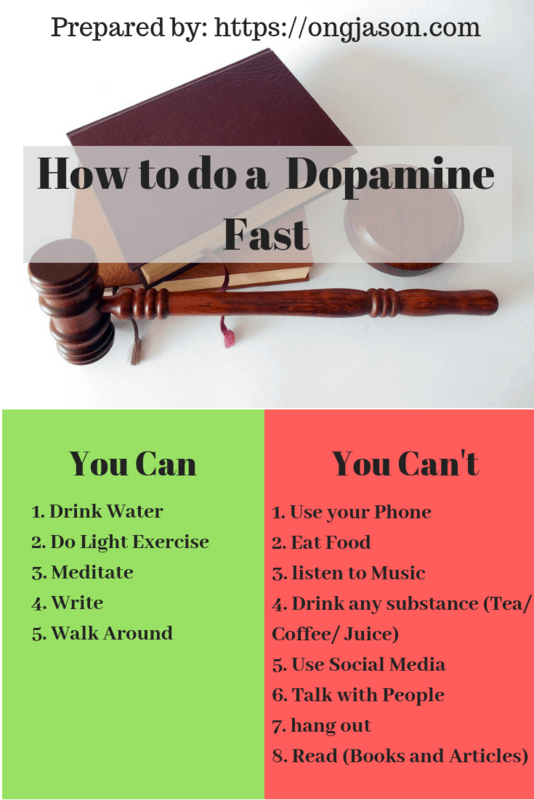 So here are the things that you can do and not allowed to do while on the Dopamine Fast. Remember the simple rule. Everything that is pleasurable is forbidden. To start, let me give you the things that you could do. So here they are. Let me focus on the writing and the meditating portion. In my opinion, this is where the meat and benefits of the said fast will come. When I did the Dopamine fast, I was able to reach the deep thoughts inside my brain and got a new perspective on what I really want, and why do I want to earn more money for my business. The things I wrote were about 5 pages long so I would not put it all in here. I would just give a summary on what are my thoughts so you could get a glimpse. So here are the things that you can’t do. This will be a lot so please bear with me. Remember that I did not made the rules. I just learned it somewhere. However, I do believe that you can eat. I did not ate the whole day because I really want to finish the actual challenge. But upon thinking, I think that eating won’t destroy the dopamine fast. Just eat 3 meals in that day. Nothing more okay? The goal of doing a dopamine fast is for you to think on what your current situation is and why. And if you just keep on eating during the window, there won’t be time for thinking. You can’t do 2 things at a time. I know what you might be thinking. Why would someone want to do something as crazy as this? This sound so miserable and pathetic. Well, once you see the benefits, you might change your mind and you might even try it out too. So the next portion will be my experience during the Dopamine Fast. To tell you frankly, doing the Dopamine fast will be the most boring thing you would ever do to your life. Imagine the rules? What would you do then? I just sat on my chair for a long time then stand up, drink water, pee and meditate. Imagine doing that for the whole day while starving to death because you are not allowed to eat. When I get hungry, I will just drink water. I drank around 4 liters of water that day. So it was very boring. I can do some light workouts, so I did some pushups. I placed my cellphone on my drawer which is locked. Don’t get me wrong though, even if that is the most boring day that has happened in my life, I did enjoyed in in the end. What I mean by this is that the reason why writing is part of the things you can do is that you should let your brain wander around and since you can’t do anything but write, you will have your 100% focus in thinking then writing things down. That way, I was able to reach the deep portions on my own self. I was able to assess what do I really feel inside, what are my goals, dreams, plans and many more. I was able to see my dream where I will achieve what I really want. For me, it is freedom. I want to be free, I want to travel. It is not only I want money, I realized that money will just be a tool for me to accomplish my goal. With a clearer vision, I was able to focus on what my goal really is. So while I was bored to hell with my life, I was able to get to a deeper understanding on myself while writing things down. I reviewed what I wrote after the fast and I was surprised that I was not focusing on the REAL THING that I want in life. Yes, I do want money. That’s why I created an online business. But the purpose on why I did it in the first place is something I’ve forgot along the way. That is the reason why I lost my motivation, it is because I lost my focus. So. I could proudly say that it is a complete success and I am happy that I took part of this challenge. So what did I learned while I was on the Dopamine Fast? What are the benefits I’ve got after participating in such challenge? I was able to experience a few, do note that you might experience more or less benefits than what I’ve experienced. It depends on how much you needed it anyway. This is pretty much the promise of a Dopamine fast. By reducing the amount of dopamine rushing on your brain, your body will naturally crave for some Dopamine. This means by things that you are bored before such as exercising will become a bit more enticing to do. Self-improvement will feel significantly easier to make and it lived up to its expectation. As for me, I was able to come back and start working on my online business again. With the motivation plus a clearer understanding of my goals, I am more confident that I will hit the target. Because if you do not know your actual target is, what do you think are the odds that you will hit it right on point? With my brain that has been craving for some dopamine, I was able to do things that I am procrastinating before. Once you get the feeling of being really bored. Imagine just sticking on your room doing nothing, you will realize how long a day is. I got to realize that even waiting for an hour is really long. As I thought of that, something came out on my mind. If a day is this long, how much work can I do to improve upon myself each day? Would I just waste this much time I got in a single day? Would I just use it do irrelevant things? That is just one of the things that I’ve realized when I went to do the fast. Time is valuable. Even the richest man can’t buy more time. We get the same amount of time each day. It is up to you if you are going to use it, or waste it. In the end, the people who used their time wisely are the ones who will have no regrets in the future. As I said above, I was able to reach the deeper thoughts of my brain. With the help of being able to think alone, I was able to write about my real goals in life. I was able to see the clearer view of things. With a deeper understanding of myself, I was able to see the bright side of things. I was able to see the target I’ve been looking for. The goal I want, dreams I want to achieve. I am not just wandering this world without any dreams. The moment you stop dreaming is the moment you start dying. With my dreams clear as day, I was able to be generally happier and contented in life. With my dreams clear, I was able to be generally happier. I was contented with what I have and I also want to improve upon myself. Don’t get me wrong. Being contented doesn’t mean that I don’t want any changes. It is possible to enjoy life, be genuine and at the same time, strive to be better. There is a big difference if you try to understand that. I am Jason, I got rejected by women a lot before due to lack of self confidence. I experienced broke up twice as of this writing, with the latest being a few months back. I am single, and bullied when I was a kid. i was called skeleton, stinky and many more. I was even called by my crush as “Yuck” once in my lifetime. 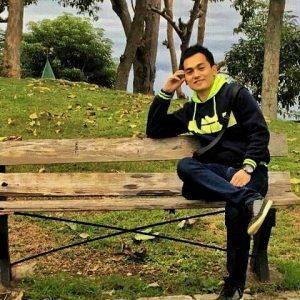 As a result, I proceed to play Video games such as DOTA which took a lot of my time when I was a child up until early 2018. At the middle of the year, my ex-girlfriend broke up with me and immediately replaced me with someone new. She did a lot of things with her new boyfriend that she did not even bother doing when she was with me. She was proud of her new boyfriend while I was a boyfriend in which she was not proud of. Not once in our relationship where she showed me on her social media and throughout our relationship she did not even show me to her parents. Is she embarrassed about me? I do not know. As you can see, I can be as genuine as I want. I do not mind sharing it with you. Because that is me, my life. However, I improved upon myself these past few months. And as you can see with my face now, I improved a lot. I started to take care of my body, read more books, focus on my business, learn a new language and to strive for more in the future. My past is my past. I do not care about it much anymore. I would pretty much tell the story to people. i am satisfied with my life. I am not embarrassed about it. Know what? I always look back. When I see how much I’ve changed. I am so happy. If I did not decide to embark on a journey to improve upon myself. I wouldn’t be what I am now. Despite the things that have happened to me, I am happy and contented on who I am and what I have right now. With the Dopamine Fast, I was able to grasp the importance of willpower. I was able to control myself from checking my phone, eat, social media and everything that is not allowed on the Dopamine Fast. Willpower is like a muscle, the more you use it. It gets stronger. While it is true that it is finite, it is a muscle and once you train it often, it gets stronger in the long run. For example: I wouldn’t dare do cold showers before, but now, I can. I just need to have deep breath and do it. This increase in willpower in the end will be the start of discipline, and discipline is the key factor to success. Do I recommend you to try the Dopamine Fast? Now that I’ve recorded the benefits I’ve experienced while on the Dopamine fast, it is all up to you. Do I recommend it to you? Yes, however I would like to add something before you start. Let me say that you can eat. There is a difference with eating the whole day with eating just the usual 3 times a day. The important thing is that you embrace the boredom while holding your pen and notebook. Why? Because the ultimate goal of this is to have a deeper assessment on your own self. Get a clearer view on what you want in life, your dreams, goals and whatever it is you want to achieve. Starving your brain in dopamine is another. I know that eating something would induce some dopamine. No question about that. So if you want to Fast, no problem. I do not suggest people who have sickness, diabetic or other health complications to do it without food. So you can do the dopamine fast with or without food. It is your choice and I recommend you to try this one. Planning to go do the challenge? Well okay let me give you some more pointers so you can do the dopamine fast efficiently. I know that some of you are not a fan of writing things down. Do remember that there will be some epiphany that will pop out of your mind and you will suddenly forgot. It is normal. It is also why smart people always carry some form of a notepad with them. So if they have some epiphany, they would write things down. Write your feelings, whatever it is that popped out of your head. The goal of this exercise is for you to have a deeper relationship with yourself. Never take that for granted. Why do you think that a lot of great ideas came from people who are in the shower? Because they are not doing anything. Their brain is mindlessly wandering and that is the moment where “aha’ moments take place. Trust me that the Dopamine fast is one of the boring activity you could do with your life. But the rewards to reap are also the best. Once you get bored, grab a piece of paper and write every thought you have. It doesn’t need to be formally written. Just write what you are thinking about. Are you experiencing some pain? Where did the pain came from? What could I do in order to solve this? What are my dreams? What are my goals? Who am I? Why am I not proud of my own story? What can i do to improve upon myself? Do I feel any discomfort today? Where exactly in my body do I feel it? It is physical or Emotional pain? Describe the pain you are feeling. What would your life be 5 years from now if you did the things you’ve listed above? Coming back to number 4. Remember that you should think of the things you CAN do. Not on things that you can’t do about such as blaming it to others. Our goal is to give us a clear path to what we want. Not to bring a dead-end. On Number 7, the purpose of that is to give you more motivation because you are imagining your live if you did not improve upon yourself. You’ve written a lot and finished the dopamine fast? Now its time to read what you’ve written. Chances are you would be surprised on the things that popped on your mind. Do not waste what you’ve written. Reread it 2-3 times to fully materialize what your goals are. The moment you fully understand your goals, it is the time that the Dopamine fast is a success. I will not give every credit to Dopamine fast. I do not know if everything that happened and the benefits are from it. Remember that I did the 7 days social media detox challenge in line with the dopamine fast. This means that some benefits I’ve got might be from the said challenge. With my goals very clear in my mind, my increased concentration, contentment and willpower, I was able to stand up back on my feet and I started to work harder again. Will this last? I do not know. That’s why the next part is important. Will I ever do the 1 day Dopamine Fast again? There might be a chance that I will do it again. I do not know if the effects will last. I guess not because Improvement Pill said it himself that he still does it twice a year. As for me, I can’t promise that I will do it like he did. However, I plan to eat next time. I was very hungry. Once I think it is ideal to do a Dopamine fast again. I most probably will. I am not sure. How about you? Do you think you should also try this challenge? What are your experiences while doing it? Do you have any more tips for the people who want to try this out? Let me know down below. Sharing is caring. I am just one single man who tried to explained everything about is to know about the dopamine fast. With your help, I know I can edit it some more in the future to be the ultimate guide. Share what you know with us below!